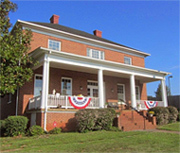 In 2008, Miss Flora Morris, (1922-2010, at right) showed her pride in Franklin County and her desire to preserve the county’s history by donating her circa 1925 brick home to the Historical Society for use as a History Museum & Research Library. With the opening of the facility, an opportunity was created to recognize your own commitment to the preservation of local history – honor a loved one – remember a special friend or organization – or call attention to your family name. Areas of the Flora Morris House can be personalized with your donation. 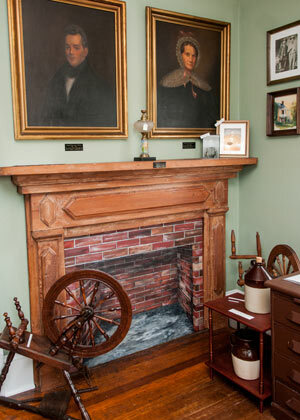 The Germantown Room, also on the second floor, recognizes one of the first towns chartered in the county. Established in 1792 on 32 acres southeast of today’s village of Wirtz, this town operated more than 50 years. This room is sponsored by Carter & Beverly B. Chinnis in memory of Mr. Chinnis’ mother, Betsy Wade Chinnis who was in the last generation of Robert Hill descendants to live in the Hill Fort/Blockhouse. The Punkin’ Vine Area, stairway & mezzanine honors the railway completed in 1892 between Roanoke and Rocky Mount, continuing on to Martinsville and North Carolina. The nickname comes from the line’s crooked route necessitated by the hilly terrain. This area is sponsored by George Hutcherson Jr. in honor of his parents, George Sr. and Reva Hutcherson, who were long-time employees of the N. Morris Department Store owned first by Miss Flora Morris’ father and then by her. The F&P Room recognizes the early, locally-owned Franklin & Pittsylvania Railroad which ran from Rocky Mount to Gretna. This second floor room houses railroad memorabilia from the two depots that anchored each end of the old Railroad Avenue, today’s Franklin Street in downtown Rocky Mount. $5,000. 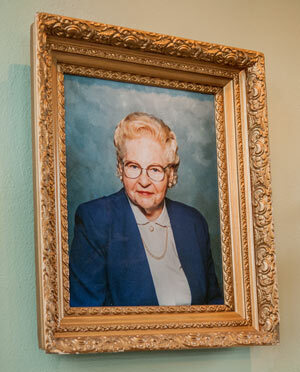 The Quilt Room, on the second floor, is sponsored in memory of Lavie Smith by her children, Janice, Judy & Kathy. This room features changing displays of quilts and homemade stitchery. The Front & Back Porches, which usher in all of our visitors and serve as staging areas for various events, are sponsored by Kevin & Sheila Kassner. The Annex (old Garage) in progress - donations being accepted. All donors - of any amount - will be listed on a permanent plaque in the first floor display area. $42,000. Donors to date: Anonymous $25,000 - Anonymous $3,750 - Peggie Foster $1,000 - L.D. Arrington $500 - Will Young $160 - Todd Mason $124 - Marvin Hale $100. We are grateful to all our sponsors, benefactors and donors. Among them is The Davis Heating & Air Conditioning Family, sponsors of the Museum’s climate control system to honor Margaret Belle Davis Parcell. Family members contributing: William (Bill) Parcell, David Parcell, Bill Parcell Jr., Ben Parcell and Bob Parcell. The system installed by Davis Heating and Air replaced the original system installed by company founder, W.D. Davis, who is the father of Margaret Parcell. Contact us for sponsorship information. Each room’s sponsor is listed on a plaque in the Museum entrance.